52m/170ft luxury yacht JADE 959 is ready for Mediterranean charter. 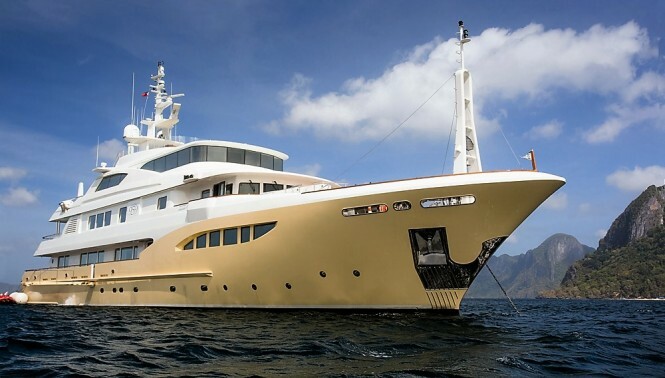 Built in 2014 by Jade Yachts, her eye-catching appearance is courtesy of Espinosa Yacht Design and her interior design work is by Central Yacht. Together, the designers have used smooth angles and pale colours to create a continuous flow both inside and out. Absorb the full chaotic and traditional beauty that is Naples from the upper deck, or sunbathe on the loungers while sipping a cocktail from the bar on the main deck. Take to the Jacuzzi to ease tired muscles after a long workout in the gym, or after scuba diving under the waves.The open plan main saloon and dining area makes use of neutral colours to enhance the light already pouring in from the windows lining both sides of the room. The semi-transparent blinds allow for greater daylight privacy, making dining at the contemporary oval table a far more intimate affair. Entertainment-wise, JADE 959 boasts a sundeck cinema, karaoke and water toys which include water skis, jet skis, a canoe, a paddle-board and a collection of towable inflatables – plenty to keep both old and young members of the party busy. Should all the activity become too much, there is a qualified on board massage therapist who can ease even the most stubborn knots. Containing 2 Master suites, 2 double cabins and 2 twin cabins, luxury yacht JADE 959 has ample room for 12 guests as well as up to 9 crew. Superyacht JADE 959 is currently available for charter in the Mediterranean at €245,000 per week plus expenses.